Betty's no can dill pickles! This recipe is from my neighbor Betty. Betty and I have swapped a lot of produce and recipes over the years. 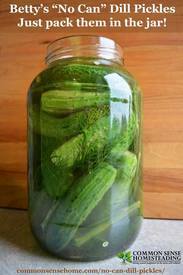 Betty makes a simple old-fashioned brined dill pickle that doesn’t require canning, and couldn’t be easier to make.